Old models, no longer available to buy. This category is purely for reference. The ALPHA 4 offers beginners and occasional pilots the confidence to lift off into the third dimension right from the start. You can completely rely on this paraglider at all times; a sense of achievement is guaranteed from your very first flight. No wonder that the ALPHA 4’s motto is “sit back and enjoy the flight”! Because of its good takeoff qualities, high stability and compactness the ALPHA 5 is ideally suitable for paramotoring. The EN/LTF certified Hybrid-Risers, which can also be used for flight without the motor, are recommended. The AXESS 2 AIR is a very light and comfortable compact harness with an innovative self-contained airbag system. 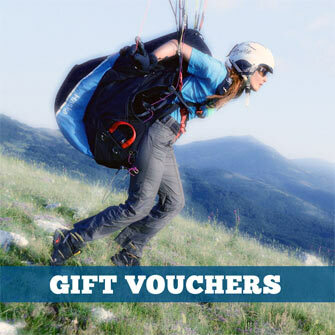 It is suitable for everyday use, as well as being ideal for 'Hike & Fly' and para-travelling! The innovative self-contained airbag provides a full level of protection at takeoff because the airbag does not need external airflow. This LTF/EN certified light harness comes with an integral reserve pocket. A pleasure shared is a pleasure doubled. The BIBETA 4 tandem paraglider is the perfect choice when great moments are to be experienced together. For leisure pilots it delivers a lot of fun – with safety; for the professional it makes an effective and trusty workhorse for everyday use. Share your passion. You want to take off effortlessly with your passenger for a stress-free flying experience? The BIBETA 5 can fully satisfy this requirement. Its excellent take-off behaviour as well as efficient turning flight and landing identify the BIBETA 5 as an absolutely reliable partner. The new EPSILON 5 is placed right in the middle of the DHV 1-2 category and offers a very high level of passive safety. Thanks to the well known ADVANCE handling, the Epsilon 5 is a superb wing for long thermal flights. This wing will help inexperienced pilots realise their flying aspirations and take the first steps towards XC flying. 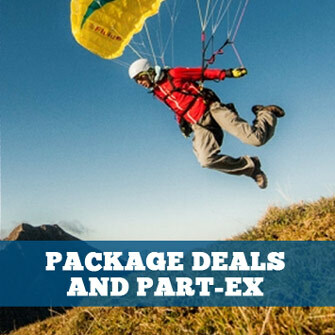 Thanks to its predictable take-off behaviour, high passive safety and great stability, the EPSILON 5 is ideally suited for powered paragliding. The 25, 28 and 31 sizes equipped with paramotor risers have been approved for powered flight by the German Ultralight Flying Association (DULV). Because of its good takeoff qualities, high stability and perfect steering behaviour the EPSILON 6 is ideally suitable for paramotoring. The DULV/EN/LTF certified Hybrid-Risers, which can also be used for flight without the motor, are recommended. The new EPSILON 7 leisure intermediate impresses by its compactness, combined with outstanding performance. Exceptionally straightforward and precise handling makes this elegant wing the perfect glider for recreational thermaling pilots. Perfectly balanced with unmistakable looks. The new EPSILON 8 conveys a distinctive feel-good factor and glows with an ideal mix of precision, performance and safety. Unique quality and an innovative inner life transform this ADVANCE classic into a robust lightweight. Enjoy the spellbinding experience of flying the EPSILON 8 – true friendship awaits.